A highly versatile aircraft that requires only a flat space for landing and can transport cargo over long distances, the tiltrotor would appear to be made for Russia. Yet despite decades of development on various projects, the country still has no rival to the U.S. V-22 Osprey. An aircraft with vertical takeoff and landing capacity like a helicopter, requiring only a flat surface to operate but able to transport cargo at high speed over long distances like a fixed-wing plane. It is a veritable dream machine for Russia, with its vast territory, sparsely populated, remote northern areas, and lack of a developed network of airfields - and in many places, the impossibility of building them. Such an aircraft does exist, not in Russia but in the inventory of the United States Marine Corps. So how was the concept of the tiltrotor born and why did the Russian Air Force and Airborne Corps not get their own version of the American V-22 Osprey that was ultimately built by aviation companies Bell and Boeing? The world's only broadly used tiltrotor finds itself equally challenged by both insurgents in Afghanistan and U.S. politicians at home. There are periodical attempts to scupper the program, which has already cost $20 billion and a price tag of $120 million for each of the 160 aircraft so far produced. But the Osprey is not so easy to bring down. Boeing and Bell are still fighting its corner, supported by the aircraft’s solid technical specifications (twice the speed of a helicopter, three times the load capacity and five times the range), with 25 years of engineering work behind it and 30 lives lost in accidents along the way. Right after the Osprey’s maiden flight in 1989 it was challenged by another Soviet design and rival, the Mi-30. But the engineers and military specialists who had been working on this design far longer than their U.S. counterparts were fated not to get their own tiltrotor aircraft. 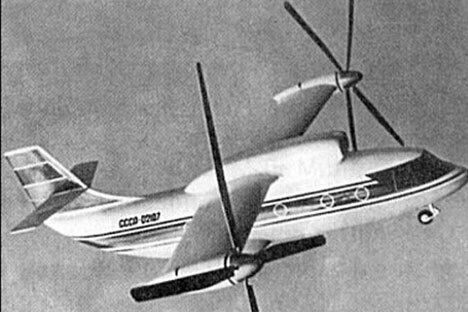 The world's first tiltrotor was drafted in 1936 by Soviet engineer Fyodor Kurochkin. His aircraft had a moveable wing fitted with twin propellers mounted on nacelles (engine housings) in the same configuration as the V-22 prototype and its corresponding AW609 civil equivalent. The next run at the tiltrotor came in 1946 with Alexander Shcherbakov’s landmark VSI high-speed fighter design. This monoplane had a raised tail section and a fixed wing fitted with twin engines that could rotate vertically at an angle of 120 degree. Its design characteristics were impressive, boasting a maximum flight weight of 5000 kg, a maximum speed of 1500 km/h and a 1000 km range. Unlike the pre-war design, the prototype was built in 1948 and underwent bench tests before the VSI was shelved because of its complexity. The 1950s saw increasing production of aircraft with simultaneously working helicopter rotors and fixed position propeller engines. The British Rotodyne aircraft produced by Fairey even set a world flight record with a speed of 307.2 km/h, exceeding the top helicopter speed by 80 km/h. But the record was soon swept away by the manufacture of the Soviet Ka-22, which was built to transport tactical ballistic missiles and could accelerate to 356.3 km/h. This screw-wing aircraft consisted of a Lisunov Li-2 plane fuselage with a simultaneously working propeller engine and rotary blade combination mounted on each wing tip. It had a specially designed and complex transmission system that was clutched from one engine to both rotors and was operated manually by the pilot. This rendered the aircraft extremely hard to fly - three of the four test crews died. The project was scrapped and the task of transporting missiles was assigned instead to the “traditional” Mi-6 helicopter. However, before the Ka-22 became a museum exhibit it set a speed record and a still unbeaten payload record, lifting 16.4 tons to an altitude of more than 2,000 meters. This effectively demonstrated the advantages of screw-wing aircraft. Work on the classic tiltrotor design with twin propeller and rotor combinations began in the Soviet Union in 1972, when the Mil Design Bureau sought a replacement for the Mi-8 helicopter. The new Mi- 30 was superior in speed and range but its specifications changed constantly in the coming years at the military’s behest. Its payload of 2 tons and 19 troops rose to 3.5 tons and 32 troops, with an accompanying increase in flight speed to 500-600 km/h over a range of 800 km. This increased both engine power and the size of the rotor blades and pushed up the aircraft’s overall weight from 10 to 30 tons. All aerodynamic work was completed by the early 1980s and the Mi-30 was included in the state armaments program for 1986-1995. However, the collapse of the Soviet Union meant that the Mi-30 got no further than the drawing board. Since sixty per cent of Russia’s territory remains still inaccessible to conventional aircraft, the tiltrotor today has broad civil as well as military application. It could also be effectively used to develop the Arctic and Pacific shelves. With its extensive experience in this field, Russia is an associate member of the European program to develop a new civil tiltrotor aircraft to replace the AW609. Meanwhile, Russia has resumed work on its own screw-wing aircraft. The tiltrotor is an aircraft with pivoting rotor blades which work vertically during take-off and then as propellers during horizontal flight in fixed-wing mode.